After having returned from 2 gorgeous weeks in France, I was suffering from a bit of post-holiday laziness, to say the least! Typing seemed somewhat alien to my fingers, and I had to squint at the screen – but some of this stuff just has to be shared. We had two days, and so we had to exercise the art of having a good time without feeling too rushed. In hindsight, we should have stayed one day longer, but not for the reasons that I would have expected. 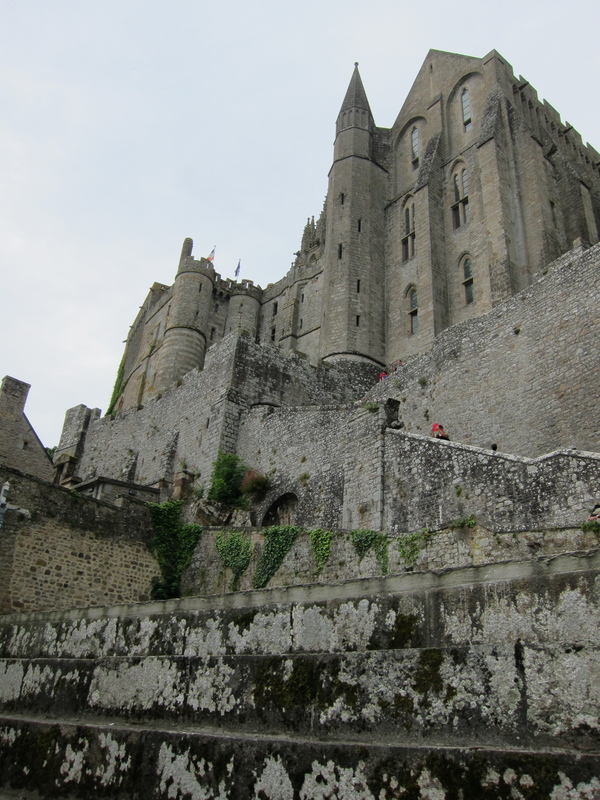 I thought initially that Mont Saint Michel deserved more time, but it was really the small, not so sleepy town of Cancale that really wowed us. 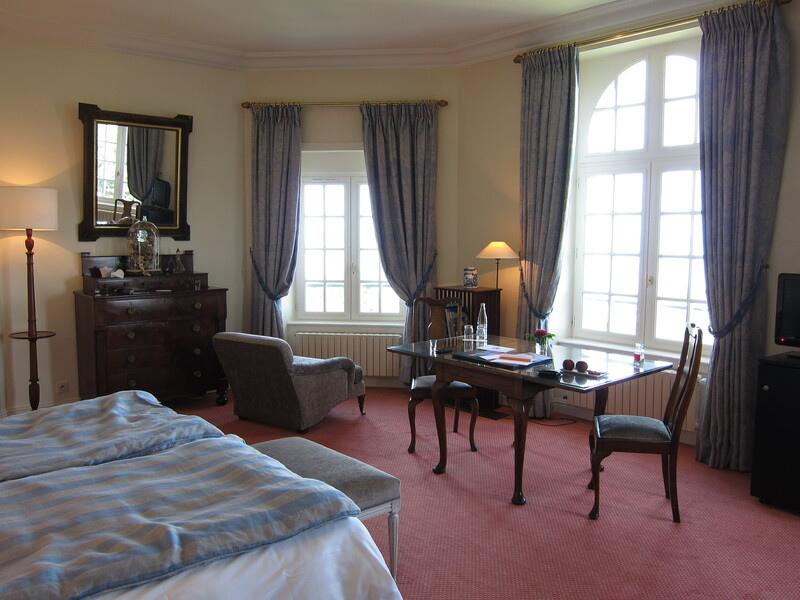 We hired a car from Paris and drove the 4 hours to Chateau Richeux. 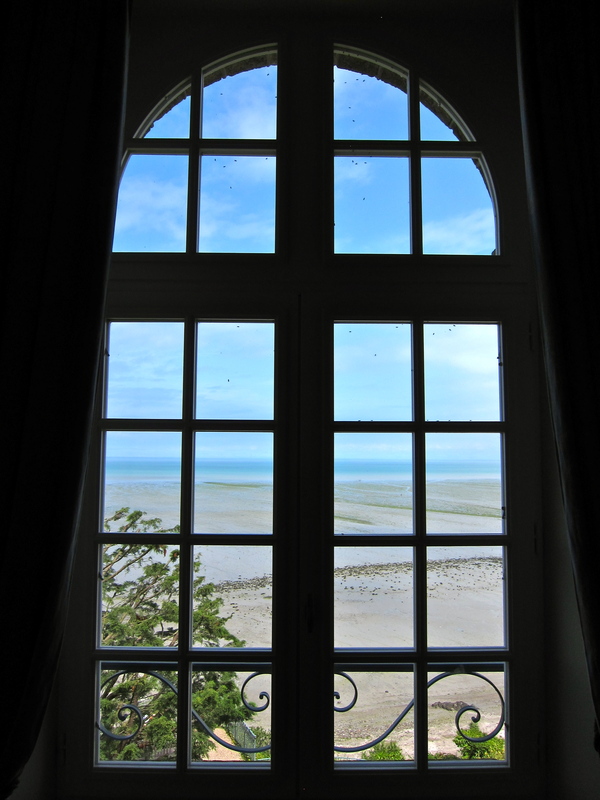 Upon arrival we were shown to our room, which was recommended to us as the one with the best view – and what a view it was. 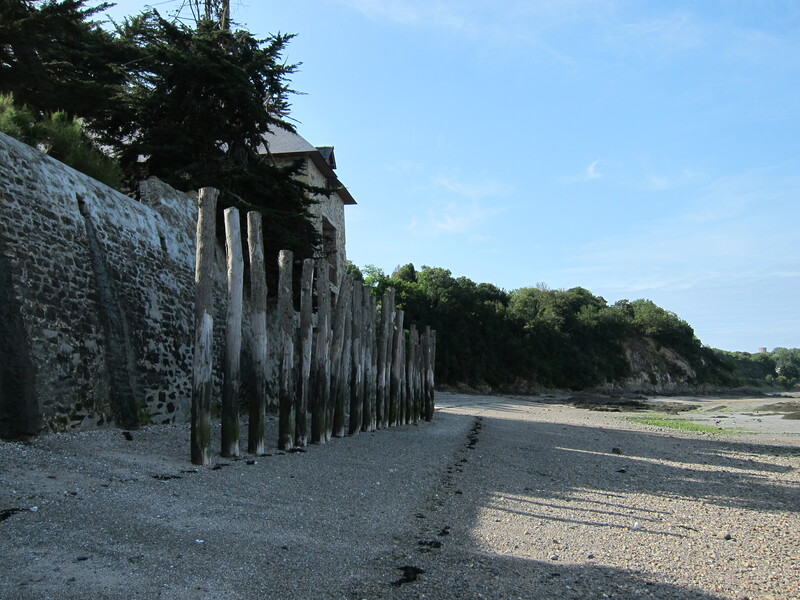 The weather in Cancale was very uncharacteristically warm. There I was with my sweaters and umbrellas, and I ended up wearing the same spaghetti-strap camisole for both days. 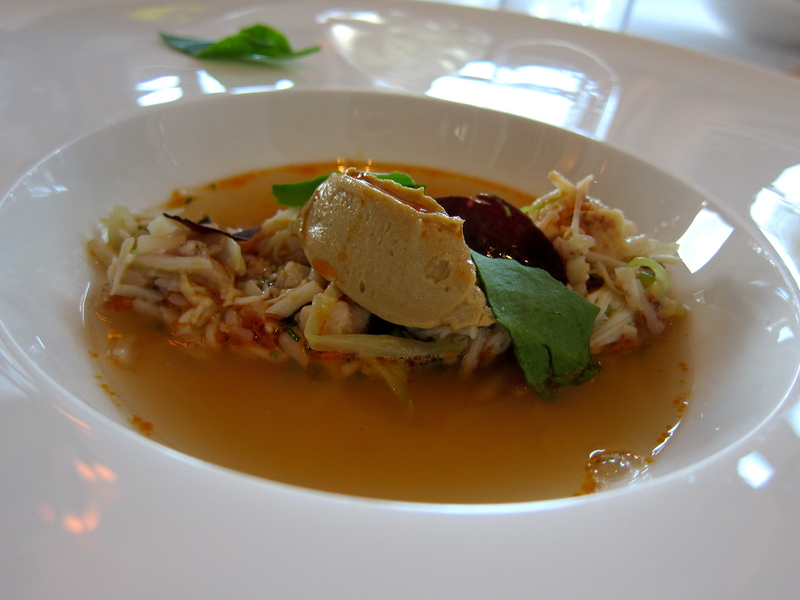 The main reason we made this food pilgrimage to Britany was a degustation dinner at Les Coquillages, restaurant of Olivier Roellinger. 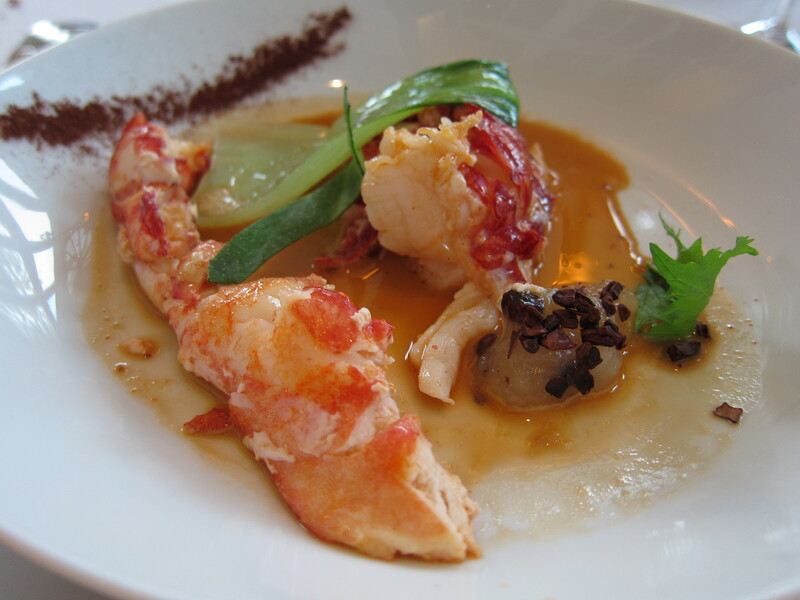 Roellinger is said to be one of the top three chefs of contemporary French Cuisine, along with Michel Bras and Pierre Gagnaire. He also has an interesting story … this chef doesn’t seem to be one overly-focused on success and fame – he once had a 3 star Michelin star restaurant, but then closed it down because he didn’t want the pressure. His passion for cuisine was also borne from a near fatal brush with death – at 21, ready for a career as a chemical engineer, he was brutally attacked by a group of youths, who put him in a coma for two weeks, and in a wheelchair for two years. In the introduction to his cookbook (which I bought and will attempt to use, knowing that I could never possibly re-create the magic combination of flavours infused in his cuisine), he writes that as a young boy he loved the sea, and the adventurers such as Marco Polo who ventured to foreign lands and brought back, amongst many other things, a glorious array of spices. As such, he is also an epicier, collecting, crushing and blending his own spices for use in his recipes, which are also sold in his spice stores. Before dinner, we went for a long walk along the beach to work up our appetites. I’d never seen anything like it before, the sea pulled back so far that the sand seemed to go on forever, and beyond that was an ocean of green seaweed that resembled a lush, green field. Beyond that, a powder blue sky, not a cloud in sight. It was not what I expected from Brittany at all! 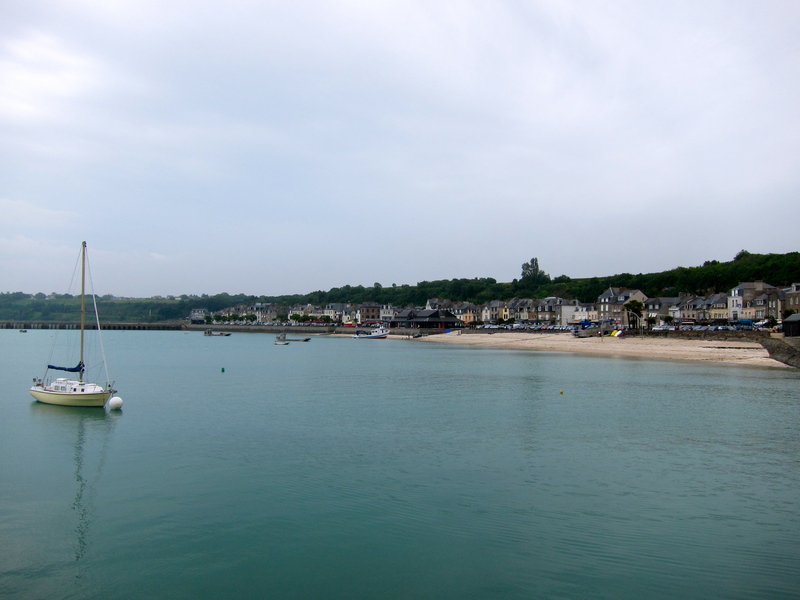 We spotted a town further down the beach (which turned out to be the outskirts of Cancale), and decided to walk there. It took longer than expected, and to pass the time (and practice my French), I made up a story in French about the Queen of Oysters who lived in this town (ahem, that would be me), who decreed that all oysters belonged to her, and that anyone caught eating her oysters would be tied to a stake and drowned by the rising tide. We saw these on the beach, hence the rather cruel and unusual punishment. Oh yes, nothing comes between the queen and her oysters! All that storytelling had made me quite hungry, and lo and behold, the VERY FIRST building, right on the edge of the beach, housed an oyster vendor, who sold mainly these wonderful bivalves, straight from the ocean, still full of sea water. It was meant to be. We bought a pot of local honey, and one of the vendors shucked an oyster and gave it to me to try. Heaven. 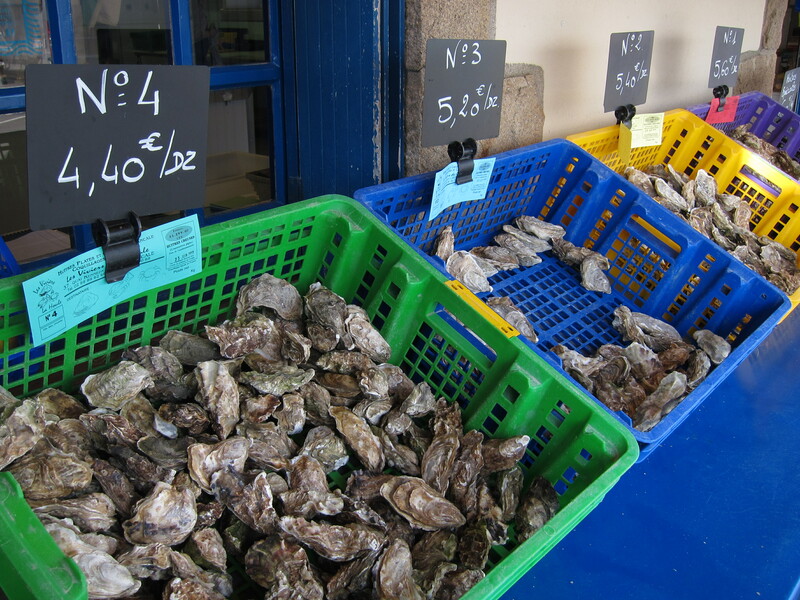 Had I known when planning our trip that Cancale is said to be the Oyster capital of Brittany, I would have devoted a least a day more for it. After this, our appetites fully whetted, we speed-walked all the way back down the beach to prepare for dinner. 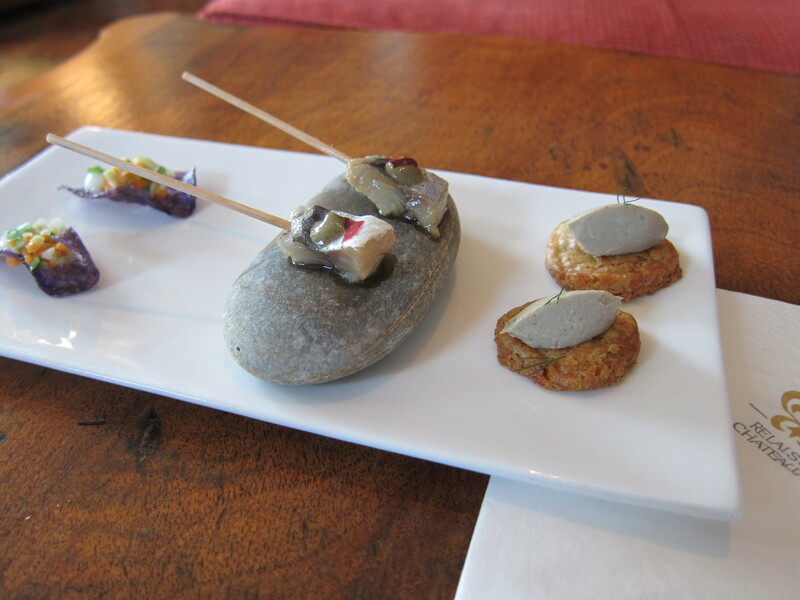 In proper fashion, dinner is always preceded by an aperitif! 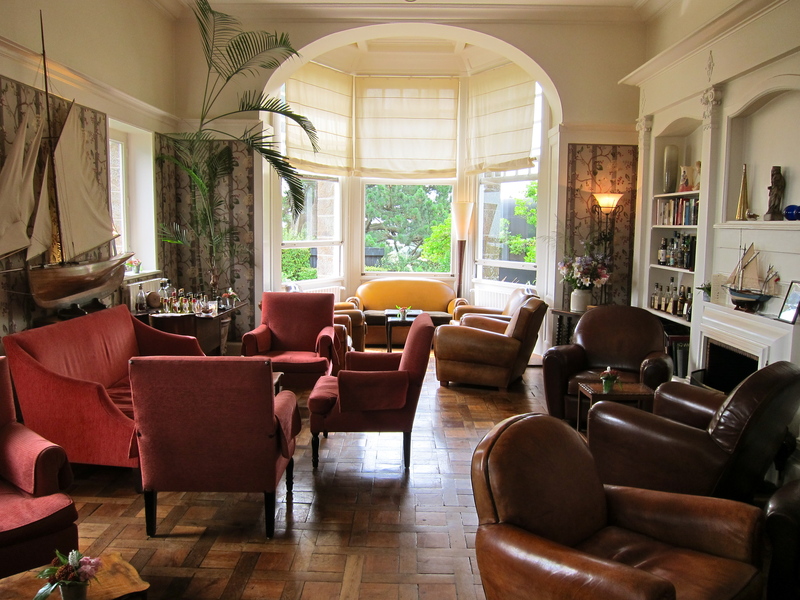 We were lead to the salon, a wonderfully cosy room decorated with all things dedicated to voyage by sea, and were served our drinks and amuse bouches. 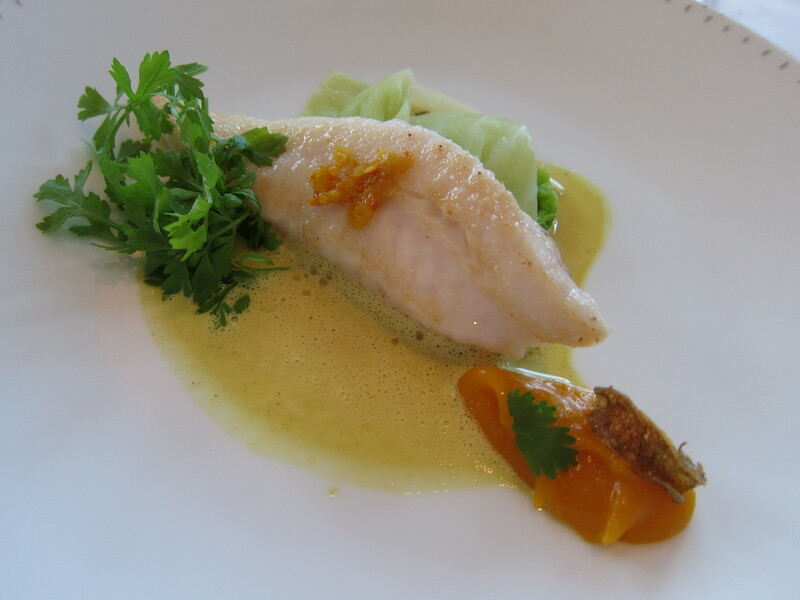 The whole meal was like a rising crescendo, becoming more flavorful, more complex, with each dish. Then BANG, the dessert trolley came and if I wasn’t sitting, I would have been swept off my feet! That salty butter caramel chocolate cake was … indescribable. It’s like in that movie Chocolat, if you got your hands on the recipe and made it for someone, they would fall in love with you. 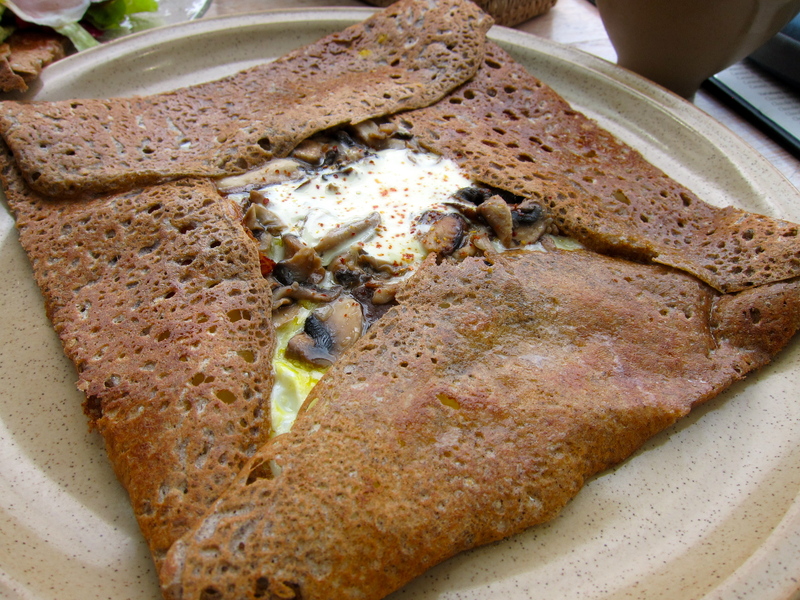 The next morning, after a quick espresso we checked out and drove the short half hour drive to Cancale to check off the second item on our list – authentic Brittany crepes! 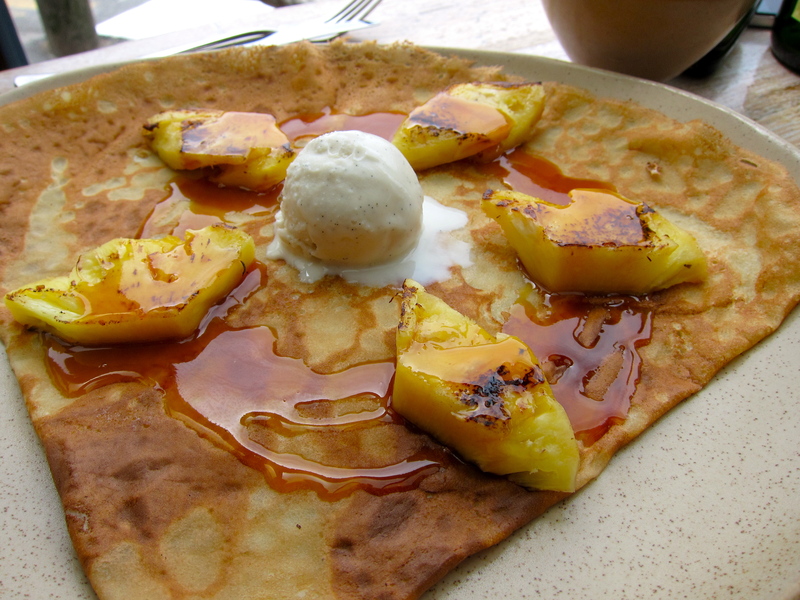 The hotel recommended a creperie called “Breizh Cafe”, with branches in Cancale, Paris and Tokyo. 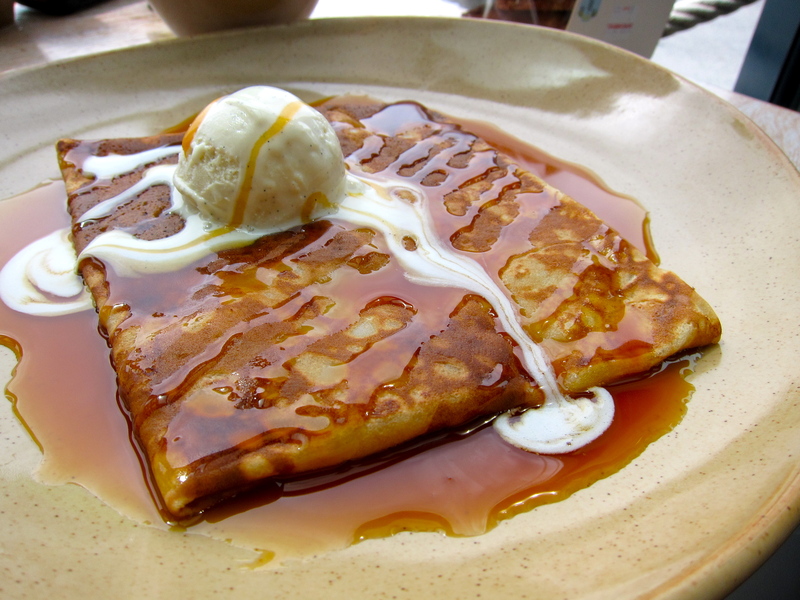 We sat watching the tourists walk by, drinking our cider out of bowls, and eating delicious crepes, one savoury and one sweet – very glad that we skipped breakfast that day! 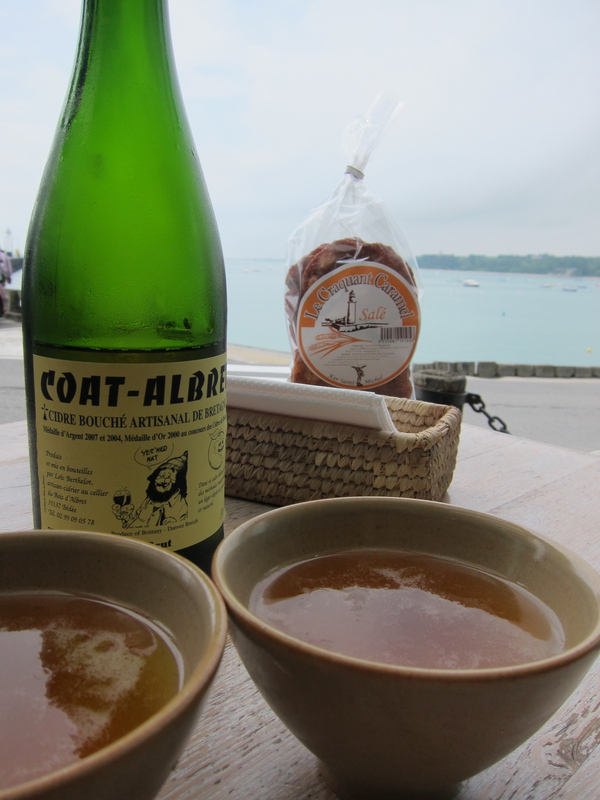 Cancale is well known for it’s seafood, and there are clearly more seafood restaurants than creperies there, but we were on a mission. It’s just one more reason for us to head back there one day. 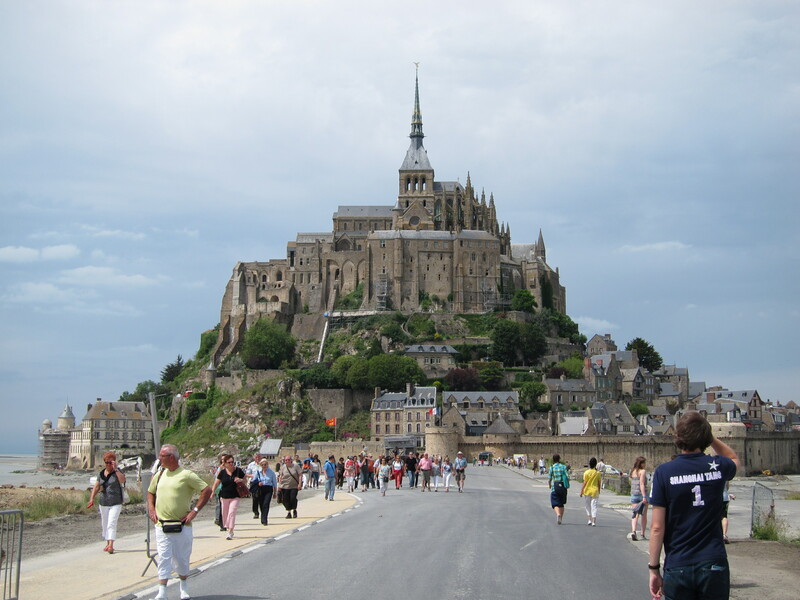 Finally, we made our way to Mont Saint Michel . In the past, one was able to drive all the way onto the island, as long as the tide was low. Sadly, this is not so anymore, and it takes some of the magic away from the experience. 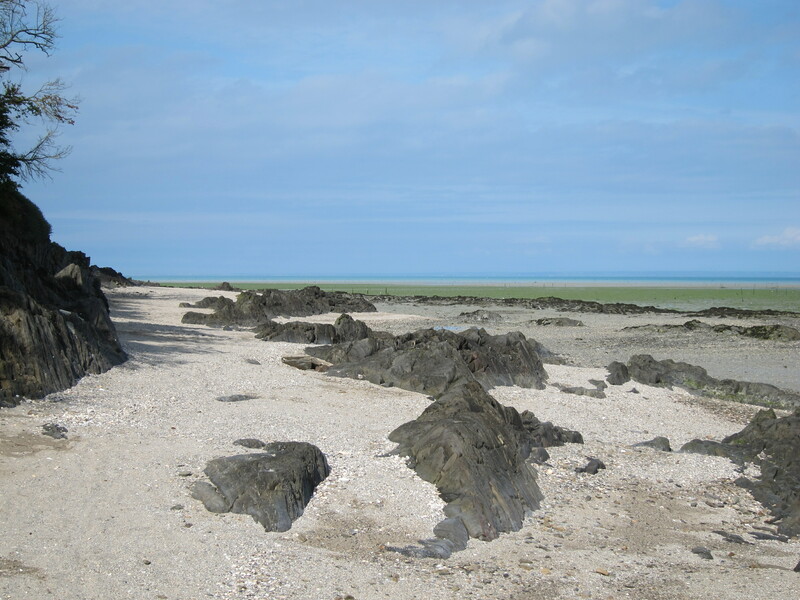 I’m sure they have done it as a safety precaution, and as a way to manage the thousands of people that visit, but when we were there it was a construction site – the mud flats surrounding the island at low tide being dredged to eventually be paved in concrete. I only wish we had visited it a year earlier. Now, one must park at a huge carpark, then walk to an area at the base of the island that has turned into a little tourist town, complete with cheap hotels and cafeterias, where you board a shuttle which ferries you to the entrance of ‘the attraction’. It’s one of those things that makes you feel like tourist cattle, a feeling that I’m not partial to. When you enter the gates, you are immediately greeted by the restaurant Mere Poulard, a lady who once made omelettes so good that people travelled from far and wide to have them. After that, there are stores selling everything from gelato to imported Chinese lace and toy plastic swords. The town itself was beautiful, perhaps I just went with too many expectations. Please don’t let me put you off seeing it for yourself, but know that it’s not the way it used to be. We spent a short hour at Mont Saint Michel before rushing back to the car for our 4 hour drive back to Paris. Wait, there is something that I’ve forgotten – the lamb, you say? Ah, well if you know me, I am not one to forget about food! I had heard about this type of lamb, specific to the region because it feeds on grass that is salty due to it’s proximity to the sea, and therefore the lamb is naturally salty. It was featured on one of the menus at Roellinger, but one that we did not take – so we had yet to try this lamb, but no time to fit in another meal. 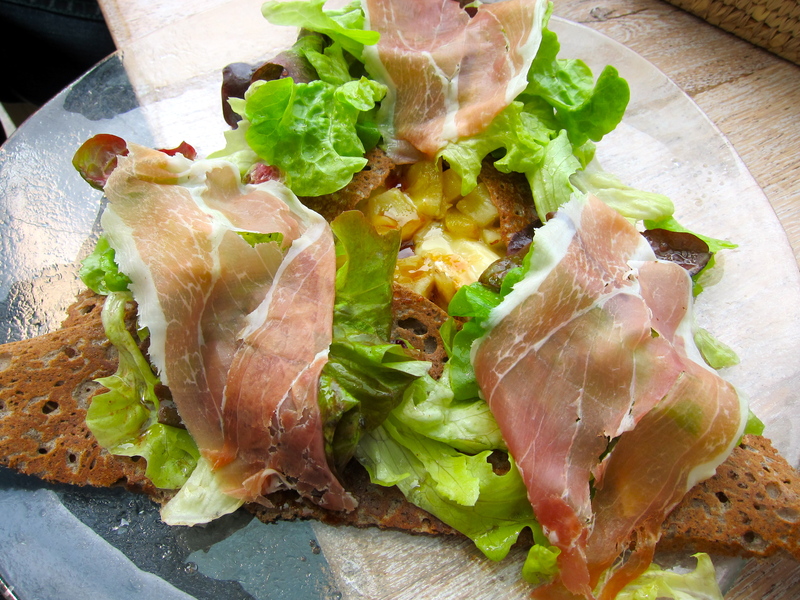 So, as the intrepid food travellers that we are, we went to the best butcher in Cancale (before going to eat crepes), bought a shoulder of agneau de pres sale (literally, lamb of the salty fields), and had it vacuum-sealed to take back to Paris! Trouble was, the butcher didn’t have any ice to spare, and we had 10 hours before we could get it to a fridge in Paris. So, we double wrapped the lamb in red and white plastic bags, asked the crepe restaurant to kindly keep it in their fridge while we ate, carried it around Mont Saint Michel with us (fearing that the car would be too hot), then propped it up in front of the air conditioning fans in the car and blasted the air con all the way to Paris, freezing our fes’ off so that our lamb would be safe. Now THAT is dedication! If you focus on the tall handsome man in the bottom right hand corner of the photo, you might just barely notice that he is carrying a red and white-striped plastic bag … yup, that’s the lamb! 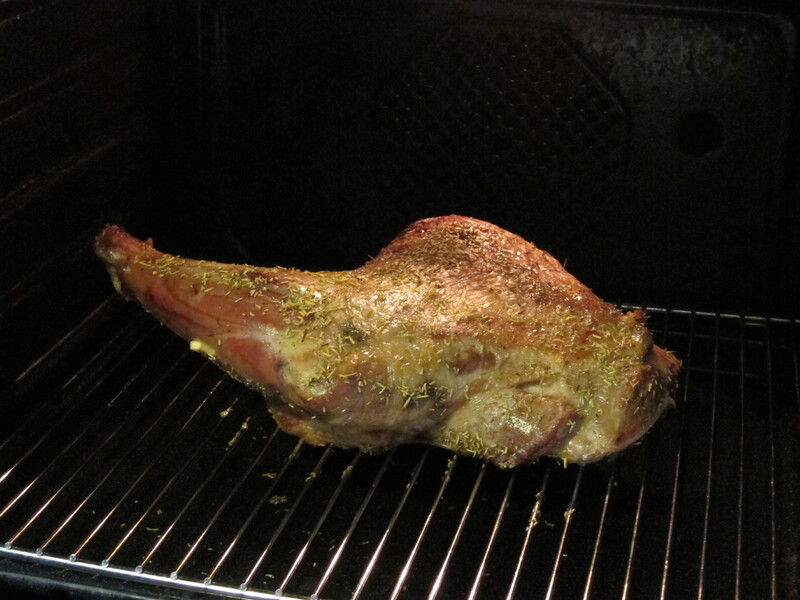 The next day, PB made a special roast shoulder of lamb for his parents, and it was all worth it. 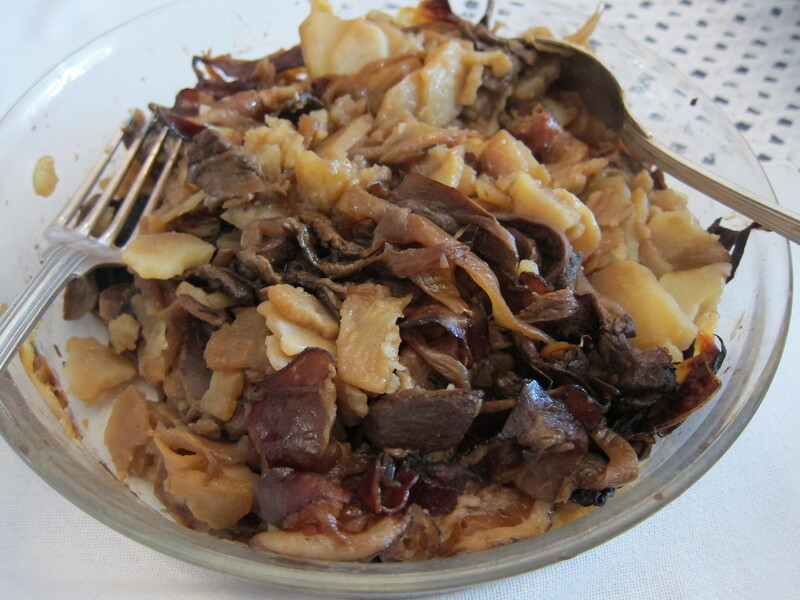 It was incredibly tasty meat, as is most of the meat in France in comparison to that which we can find in Hong Kong. Perhaps it did have an ever so slight hint of natural saltiness to it – or perhaps it was in our minds. 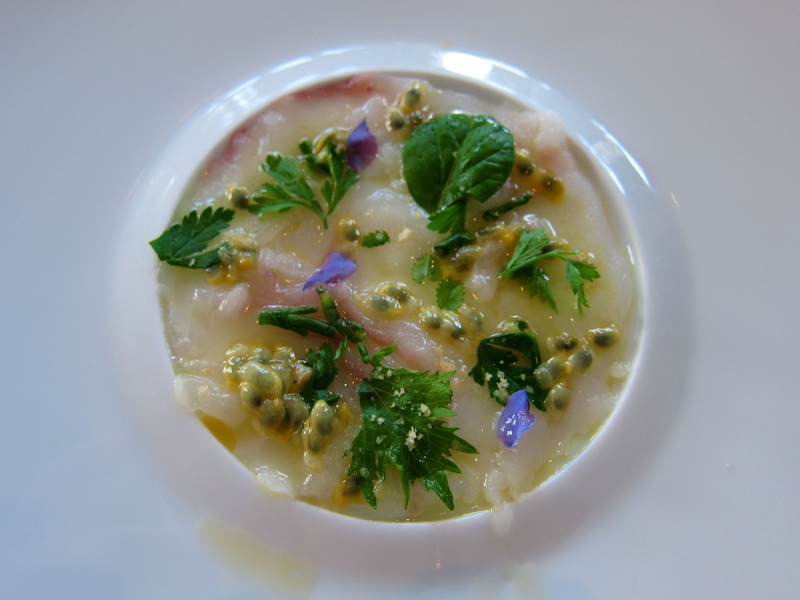 It was a lovely meal though, a fun story to tell, and an excellent way to savour the flavours of Cancale for one more day. Accompanied by Madame B’s famous potato gratin! 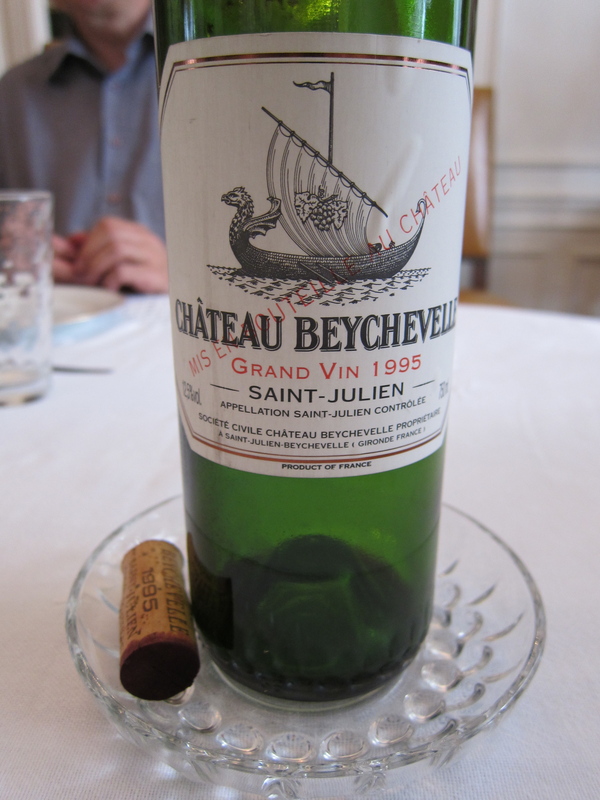 And of course no meal is complete without a suitable bottle of wine! 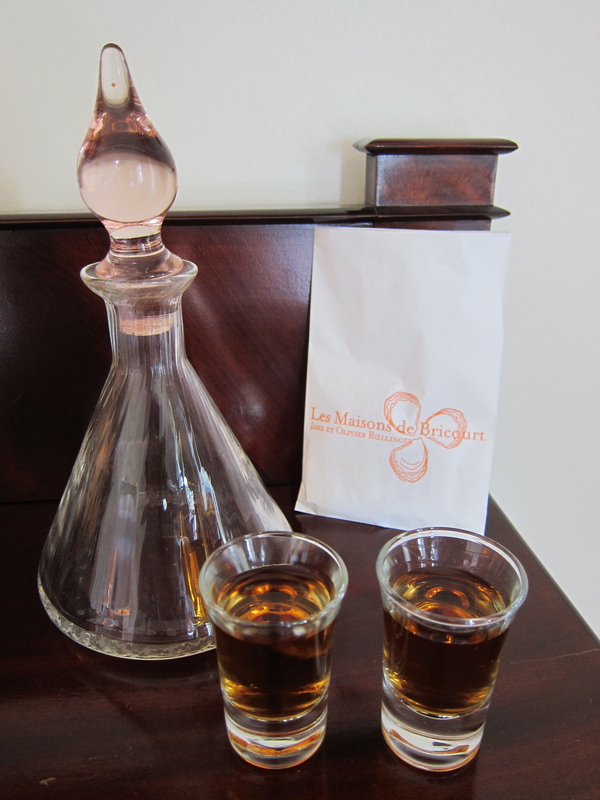 Our next side-trip focused on not on food, but on imbibing fine beverages – CHAMPAGNE!